That last screenshot was pretty subtle. Here’s one that’s downright garish. 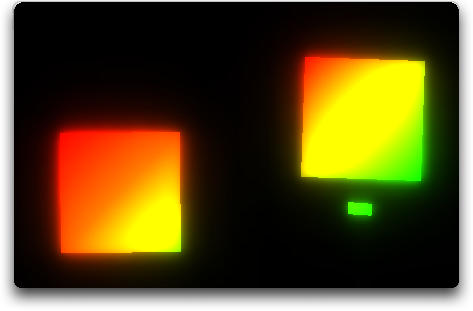 These are three boxes, rendered using a single overlay. Each box is rendered as ‘white’ in VectorStorm, but they’re all sitting under a single overlay that acts as a gradient from red to green, so the final colors that show on screen are between red and green, depending on locations of the boxes. As the boxes move and spin, they move beneath the color overlay as you would expect them to; the color is stationary on the screen as though it was a sheet of cellophane laid over it, rather than moving along with the boxes. 9 February, 2008 in VectorStorm.